The key market players in the battery management systems market are Atmel Corporation, Ashwoods Electric Motors, Eberspächer, Elithion, Inc. AVL, Johnson Matthey, Ewert Energy Systems, Inc., Lithium Balance, Linear Technology, Midtronics, Larsen & Toubro Limited, Merlin, Mastervolt, NXP Semiconductors, Nuvation Engineering, LLC Corporate, Navitas System, Texas Instruments Incorporated., Panasonic Corporation, Valence Technology, Inc., TOSHIBA CORPORATION, and VENTEC among others. These players are set to power the battery management systems market in the near future. The Global battery management systems market was capitalized at almost USD 2,260.3 Million in the year 2016. The battery management systems market is likely to cross almost USD 10,509.9 Million by 2024. 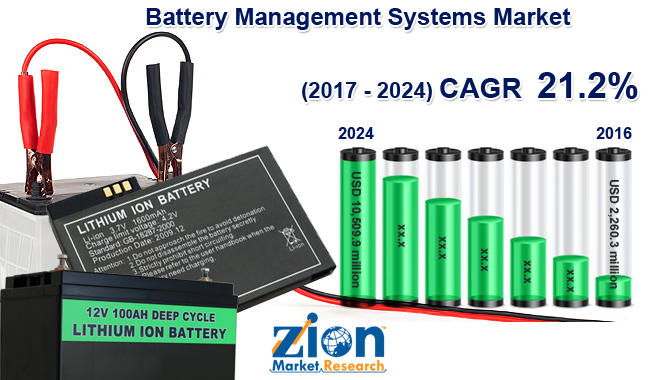 Experts at Zion Market Research claim that the global battery management systems market is likely to show a CAGR of over 21.2% from 2017 to 2024. The major factors that will boost the development of the battery management systems market are the rising employment of battery operated devices such as an e-bike, electronic vehicle, and portable devices. Furthermore, increasing demand for UPS system due to pacing shift toward the IoT (Internet of Things), cloud computing, and digitization is accelerating the requirement for UPS (uninterruptible power supply) systems all over different applications all over the world, positively affecting the battery management systems market. Research analysts at Zion Market Research came up with the conclusion that there will be a rising need from the portable device sector powering the for the battery management systems market. Various innovative launches by major players are set to drive the battery management systems market. For example in January 2018, Nissan rolled out an all-in-one home energy solution, comprising a battery, solar panels, and a battery management system, powering the battery management systems market. The global battery management systems market is divided based on component, battery type, application, topology, and the geographical regions. Various kinds of batteries are being employed for different applications. Advanced lead-acid batteries, Li-ion–based batteries, nickel-based batteries, and flow batteries are the major kinds of rechargeable batteries employed in battery management system market. Amongst the batteries kinds, Li-Ion-based batteries added up a huge share in global battery management systems market and likely to set a high CAGR in the years to come. Li-ion-based battery is adopted in various applications due to its high energy, lightweight, low standby losses, and high power density. This is likely to power the development of battery management systems market in the years to come. The battery management systems market is developing at a rapid rate in the developed areas. North America rules the battery management systems market and is likely to sustain its supremacy in battery management systems market.